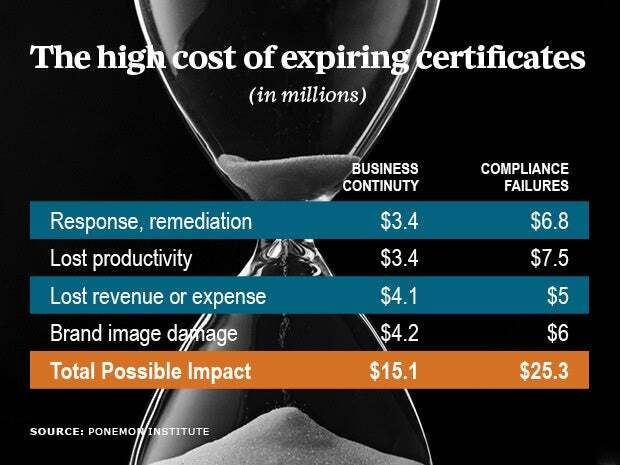 The average global 5,000 company spends about $15 million to recover from the loss of business due to a certificate outage -- and faces another $25 million in potential compliance impact. These estimates, based on a Ponemon survey of about 2,400 global respondents, include remediation costs, loss of productivity, lost revenues, and brand image damage. This past April, for example, Instagram forgot to renew its security certificate, causing security warnings to pop up for its website visitors. Also this past spring, smart home company Wink Inc., had to recall its $50 Wink Hubs because of an expired certificate. Even global tech giants are susceptible. Also this spring, Google allowed one of its SSL certificates to expire, causing problems for millions of Gmail users. And, in 2013, Microsoft's Azure cloud platform had a worldwide outage because of an expired SSL certificate. The average organization had two unplanned certificate-related outages over the past two years, according to the survey. Nearly two-thirds of respondents, or 59 percent, said they lost customers to due to unsecured keys and certificates. In addition, the average organization has failed at least one SSL/TLS audit and at least one SSH audit over the past 24 months. When it comes to business continuity costs, the biggest part, or $4.2 million, is brand image damage, followed by $4.1million in lost revenues, and $3.4 million each for lost productivity and remediation expenses. Lost business costs included not just the loss of revenues during the outage itself, but also an abnormal turnover of customers and increased customer acquisition costs. For compliance failures, the biggest cost, $7.5 million, is for lost productivity. This is followed by $6.8 million for remediation, $6 million for brand damage, and $5 million for lost revenues. 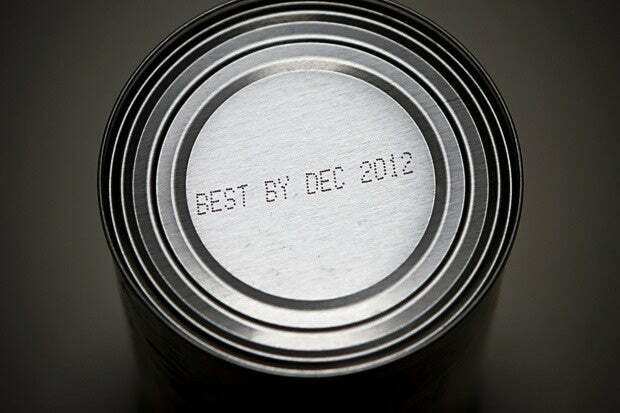 But expired certificates can lead to other, more subtle, problems. "You're teaching your customers and users to ignore the certificate warnings," said Gavin Hill, director of product marketing and threat Iintelligence at Venafi, which sponsored the research. It also means that criminals that act fast have a window of opportunity for phishing, he added. "They're quickly standing up spoofed websites and doing some cookie injections, redirecting folks from an expired site to a spoofed site," he said. "That's very possible, absolutely." According to Ponemon, the risks will only increase with the growth of the Internet of Things. As the Wink Hub outage demonstrates, connected devices can also rely on certificates, as does the growing mobile ecosystem. Companies need to conduct regular audits to locate all the certificates and keys they are using, determine expiration dates, and then put proper policies in place to avoid data breaches, unplanned outages, and failed audits, Venafi recommended.